I made a batch of gluten-free chicken and dumplings using my "go-to" gluten-free biscuit mix Bisquick. I even used Betty's recipe. While eating the scrumptious chicken and dumplings my hubby had the idea of making the same dish using chocolate gravy . Chocolate Gravy is a favorite with my kids. They are all grown up and still L.O.V.E. chocolate gravy. I thought it a good idea, easier than making biscuits and gravy separately. 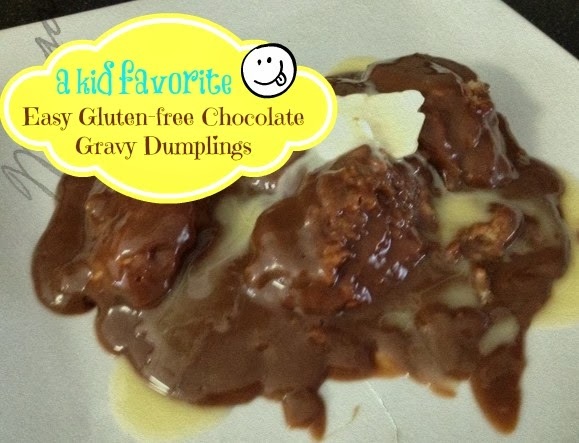 Easy Gluten-free Chocolate Gravy Dumplings are the result of his imaginative flavor palette! Please try it for yourself with this recipe. In a large frying pan combine sugar, cocoa, cornstarch, and salt. Whisk in the milk and butter. Before putting on stove, complete step 3. In small bowl, stir dumpling ingredients with fork until blended. Place frying pan with gravy ingredients on medium heat and bring to light boil. Reduce heat to low. Gently drop dumpling dough by 8-12 rounded spoonfuls onto boiling gravy mixture. Cook uncovered over low heat 10 minutes. Cover and cook 10-15 minutes longer. Spoon dumplings onto plate and cover with gravy. Spoon additional butter over hot gravy if desired.